This rendezvous scheduled on March 4, 2011 and March 5 is a reunion of western musicians, cowboy poets, and artisans to promote the culture of western life here in the beautiful Cache Valley of Northern Utah, located 90 miles north of Salt Lake City. 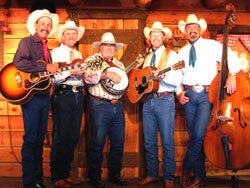 The Main Auditorium will feature the Bar J Wranglers from Jackson Hole Wyoming in concert along with guests: Canadian Songwriter – Eli Barsi, Cowboy Poet & Humorist – Andy Nelson and National Yodeling Champion – Larry Wilder. Concerts will be held at 7:00 p.m. on Friday March 4, 2011 with a matinee concert on Saturday March 5, 2011 at 2:00 p.m.
On Friday evening and all day Saturday there will be a continuous round of Cowboy Poetry and Western Music on three stages – two of which will be for ‘published’ and/or ‘professional’ performers, one being an ‘open mic’ stage for local, and/or unpublished performers. Each poet will be given a 10 minute time slot, with musicians receiving 20 minutes. Other attractions will be dutch oven dinners, vendor and artisan trading post, educational activities and a poetry contest for kids, culminating with a family dance on Saturday evening. We welcome all ages and encourage families to attend. Youth Poetry Contest – (see drop down link for more info on this). Bar J Wrangler Concert Tickets The purchase of a Bar J Wrangler Concert Ticket includes General Admission into all other Rendezvous activities on Friday evening and all day Saturday. General Rendezvous Admission Ticket Prices The purchase of a General Admission ticket to the Rendezvous will allow entrance Friday evening and all day Saturday, to ALL performance stages, trading post areas, and the Saturday Night Family Dance, – everything EXCEPT the Bar J Wrangler Concert. Friday night menu: Roast Beef, Dutch oven potatoes, baked beans, veggie, lemonade or water. Saturday lunch menu: shredded pork sandwich, chips, cookie, drink. Saturday night menu: Pork Loin, Dutch oven potatoes, baked beans, veggie, drink. Kids meals available on request.